What the heck is Tortilla Soup? Is it Nachos in a bowl? Do I grab a Quesadilla, throw it into a blender and voila I have Tortilla Soup? What an odd concept for a soup! Are you thinking what I’m thinking? Yup. The first time I encountered Tortilla Soup on a menu I thought it was the oddest concept and had very strange looking soups floating around in my little brain. Well, I have to say I was pleasantly surprised. Tortilla soup is light, refreshing, tangy and full of delicious Mexican flavours (my fav). I was pretty pleased after I found Tortilla Soup for the first time. The first time I encountered Tortilla Soup was in the USA when I was on holiday with my now hubby. I was on holiday from Air Navigation School which I was attending in Winnipeg, Canada, I know sounds random, it’s a long story which I’ll no doubt blog about some day but for now it’s all about this darn good Tortilla Soup (and yes, I can and will write a whole blog post on Tortilla Soup…and you thought it couldn’t be done). We were travelling around the states and I kept encountering Tortilla Soup on the menu, it’s pretty staple over there so I’m sure any of you Americans reading this right now think that I must be an alien or something out of Men in Black for not knowing what Tortilla Soup was until my early twenties. I kept wondering what this strange sounding soup could be and how anyone other than Heston Blumenthal could make a soup out of a corn chip. Chips belong with dip, they’re a nibble, a snack but not a soup. We even went to a really fancy restaurant and it was on the menu there – couldn’t escape it, it was like the Tortilla gods were taunting me. So in the end I succumbed and ordered the chip-soup mutant. Hello new best friend!! It was amazing. It was fresh, tomatoey, tangy, slightly spicy and so fresh with tonnes of fresh coriander (cilantro) sprinkled on top. It was quite delicious and a soup that I could, and would continue to, have anytime of year – so light yet so comforting. As for the Tortilla Chips, well I still firmly believe that the soup should come with some sort of fine print because the Tortilla chips are in actual fact just scattered on top, just like croutons – duh! Why didn’t someone tell me that when they stamped my passport into the States? It makes perfect sense. They add a delicious texture, saltiness and contrast to the soup – perfection. I went on to sample many a Tortilla Soup – some where thicker and heavier, some light but all super delicious. 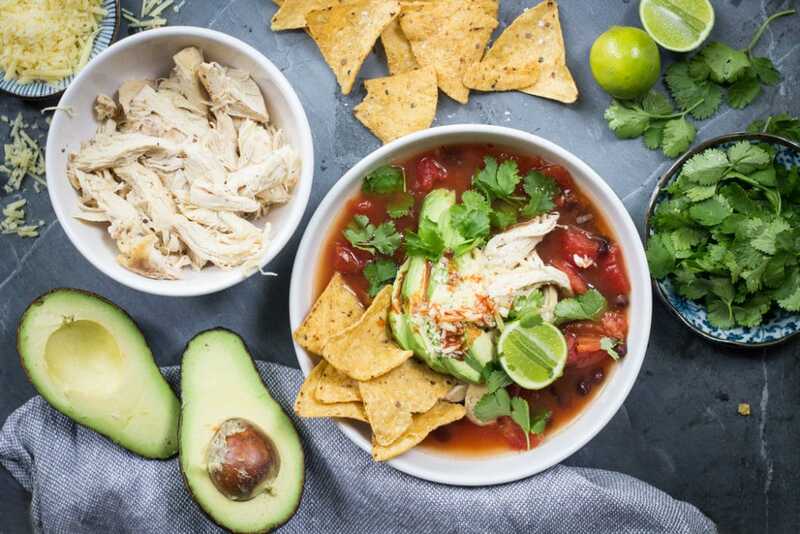 I’m always looking for easy, tasty weeknight meals so I came home to New Zealand and made my own quick and easy weeknight Tortilla Soup. 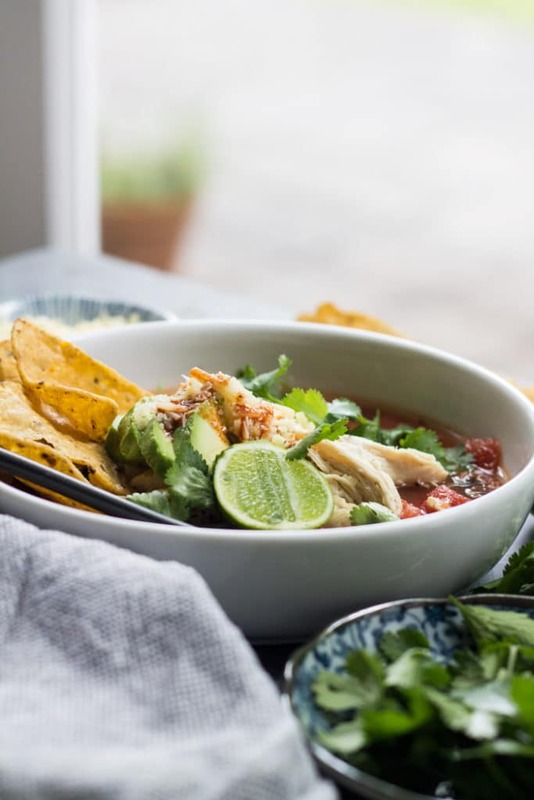 I actually call it my 10 Minute Tortilla Soup because if you have some left over roasted chicken or have been organised to cook it the night before (rarely happens in my house) then you can actually whip this up in less than 10 minutes. You can also whip this up in under 10 if you want to keep it vegetarian, just remove the chicken and replace the stock with vegetable stock It is equally delicious like this and filling as the black beans add some protein and substance to it. 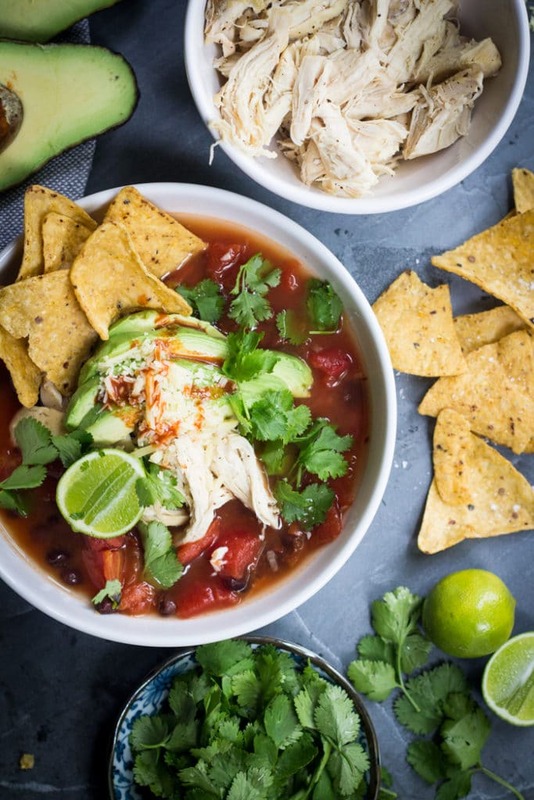 I recommend to anyone who hasn’t tried Tortilla Soup to give this a go, especially if you love light, fresh Mexican flavours and to anyone that has grown up on Tortilla Soup, this one is a good one to add to your repertoire – it’s a super fast and easy weeknight meal that is also really healthy. Who doesn’t need that in their repertoire? There. A whole blog post on Tortilla Soup. Hope you enjoy! If you haven’t already cooked your chicken breasts then see Note 1. You will need to allow yourself at least 20-30 minutes for this recipe if you haven’t already cooked your chicken breasts earlier. Either finely chop or puree the chipotle peppers and combine with the adobo sauce (see Note 2). In a large saucepan combine the stock, tomatoes, garlic and chipotle. Bring to a simmer then add the black beans and chicken. Simmer for approximately 5 min to heat through the chicken. Add the lime juice and stir to combine. 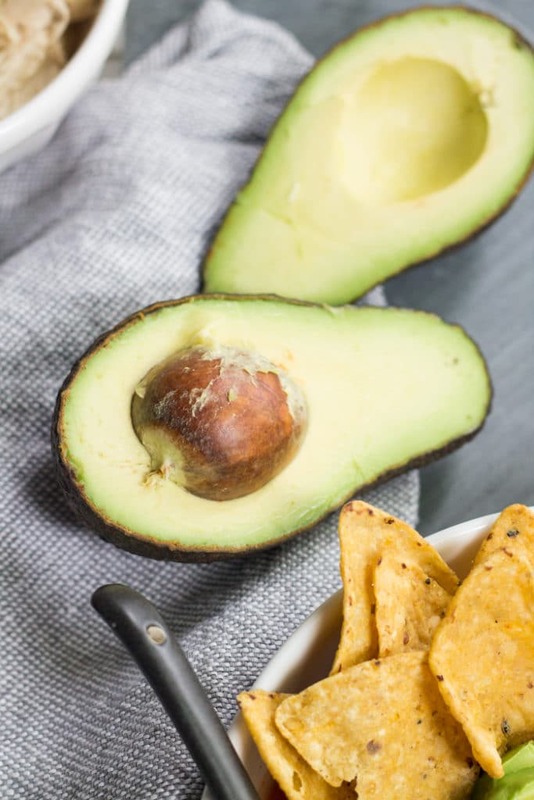 Divide soup between bowls and top with tortilla chips, avocado, cheese and coriander (cilantro). Garnish with a wedge of lime. 1. Preheat oven to 200C (390F). Place chicken breasts on a baking tray, drizzle with olive oil and season with sea salt and freshly cracked black pepper. Bake for 20-30 minutes or until cooked through. 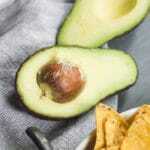 If you need to, cut one open to check that is cooked and opaque all the way through. 2. 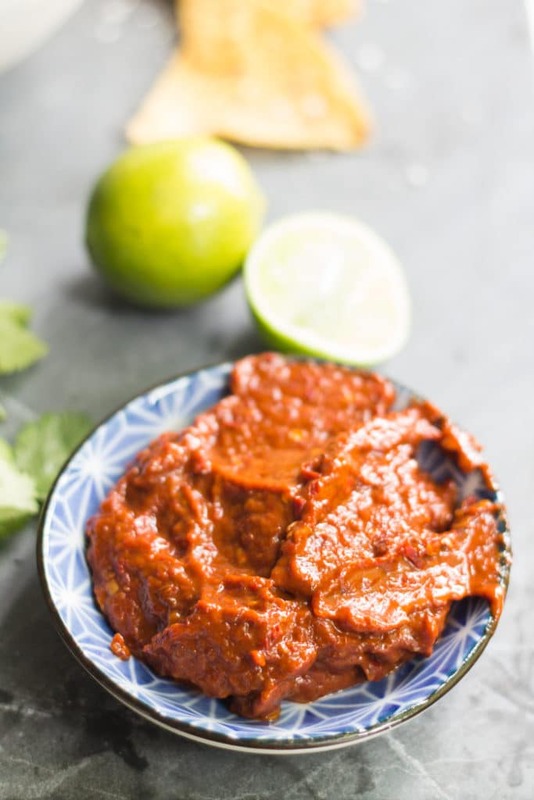 I find the easiest way to do this is to take a whole can (they are usually small, around 1/4-1/2 cup) and puree the peppers with the adobo sauce (smokey tomato sauce that the peppers come in. 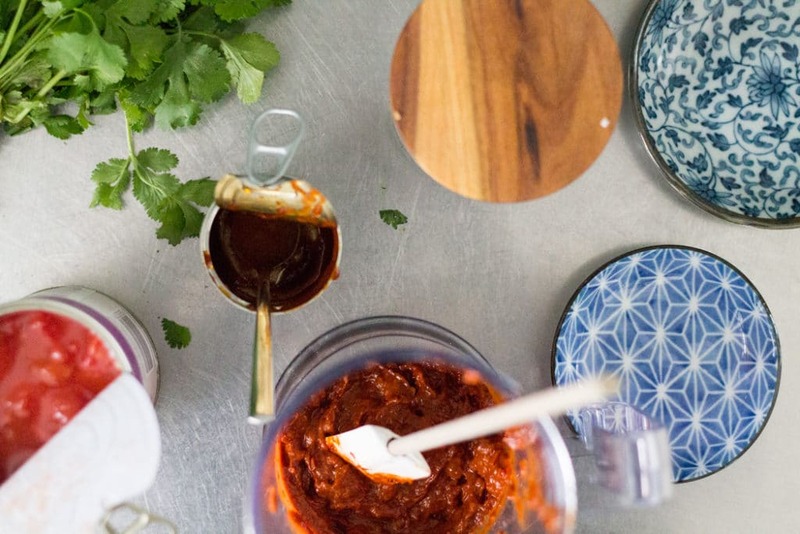 I then use approximately 1 Tbsp for every chilli I need, so for example in this recipe I would use 2 Tbsp (one for the chilli and one for the sauce). Canned chipotle peppers are now rather easy to find in the international section on the supermarket or online. If you can’t find them you can always substitute with dried chipotle peppers or any chilli you can find, but my preference is definitely for the canned chipotle if you can find it to give a mild smokey, tomatoey flavour and heat. You can find Chipotle Peppers in Adobo Sauce here. To make dairy-free remove cheese. To make meat-free remove chicken and replace stock with vegetable stock. To make vegan remove cheese and chicken and replace stock with vegetable stock. You pictures were enough to convince me for this heavenly looking Tortilla soup, but then after reading your whole blog post, I just can’t wait any more to make it in my own kitchen! And just so you know even I am new to Tortilla soup!! Well it’s only 6 months after you left that lovely comment Priyanka and I finally reply!! I am so so sorry! I don’t know how you managed to sneak in a comment without me noticing. You must have thought me so rude! I really hope you enjoy the soup, after you try Tortilla Soup for the first time I guarantee you’ll be a convert!